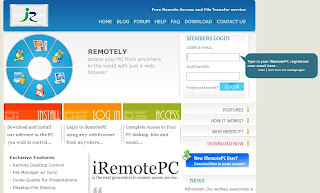 I Remote PC is remote desktop and file transfer access for your PCs. It helps you to use browser access and manage another PC anywhere in the world, like home, office, school. If you want share files with other people's PC, you can use it without upload file, direct to check, look, use, and download files. It is not a PC to PC software, it is a remote desktop controller. Both PCs need download a software from its website first, and free to use.